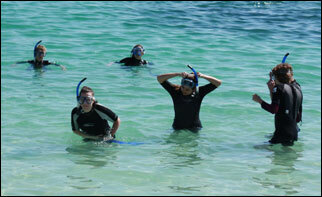 The Galapagos Islands are heralded as a superb snorkeling destination by enthusiasts around the world. And a high percentage of the visitors who come to the islands participate. If you want to do a lot of snorkeling, pick a boat that emphasizes snorkeling on at least even footing with land excursions. Many cruise boat lend or rent (for a reasonable fee) snorkeling gear: mask, snorkel, fins, and sometimes wet suit. If the boat takes gear reservations, make them early for your sizes because sometimes the supply may be reserved by other passengers before you arrive. Better yet, bring your own gear to ensure availability, quality and good fit. (Note: A few boats like the Celebrity Xpedition cruise ship not only lend you the good-conditioned gear without charge, they stock an ample supply (including wet suits) to satisfy all their passengers. From June to December, you will probably need a lightweight wet suit. However, in August and September, a medium weight wet suit is sometimes preferable. Be aware that currents can be strong during the dry season: From June to December, and particularly in August and September. (This issue is more critical for divers because they usually go farther off shore. The favorite snorkeling site of most visitors is the one next to Pinnacle Rock on Bartolome Island. The setting is picturesque and chances are you will be snorkeling with frisky Galapagos penguins.